Knighting Ceremony - relive the full glory of the Knights of Malta with a personal encounter with the Grand Master himself, while witnessing a Knighting Ceremony. 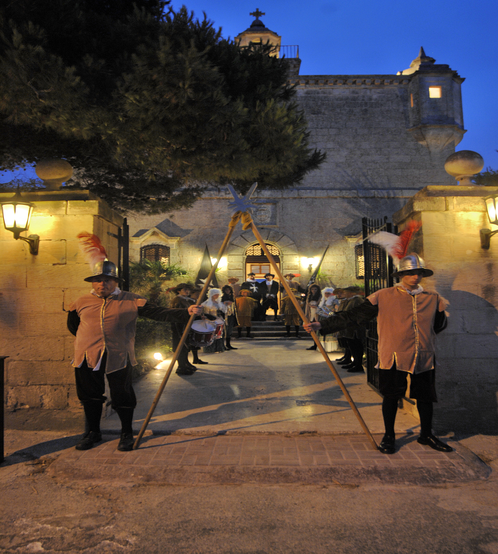 Maltese Festa - It´s festa time in traditional Malta of long ago! Admire the intricate skill of the wicker basket maker, lace maker, weaver, tambour player and fisherman, and enjoy the gentle sounds of the strolling musician and the village band. Pirate Night - Guests dress up for the occasion in pirates' costumes, while the dining hall is embellished with banners, both large and small, sporting the skulls and crossbones. Toga Party / Romans Era - With their richness in costumes and elegance, the denizens of ancient Rome have always held a special fascination for modern humans. With a themed night based on Roman culture, one is able to sample some of their legendary panache. Casino/Bond Night - Style, class and glamour will be the main theme. What other name is synonymous with Casino other than Ian Fleming's James Bond.The latest James Bond blockbuster inspires the décor and the mood of the evening, where high stakes and chance will give way to fun and laughter throughout the evening.